This article is a collection of build notes for my T900 tricopter project. The mass of the fully populated quad is ~1300g. 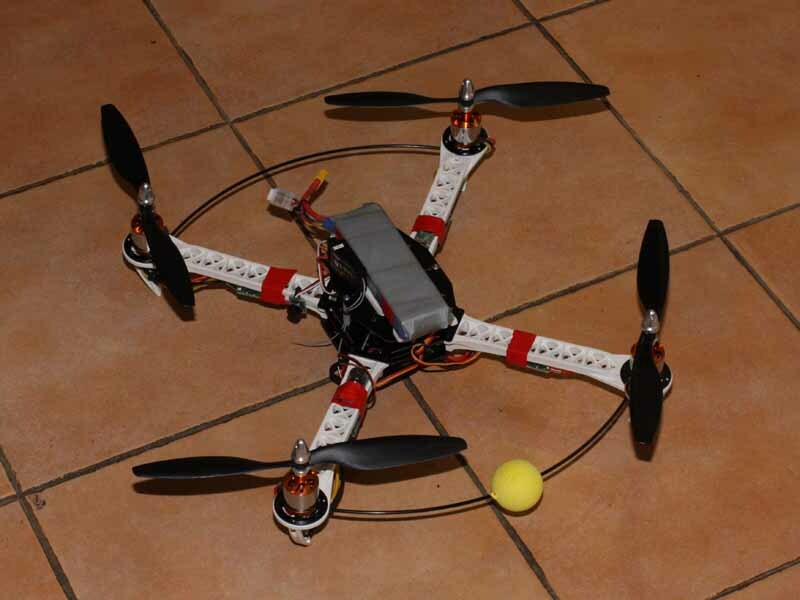 Fig 1 shows the built tricopter. The spaced between the lowest and middle deck is too small to accommodate a flight computer or battery... it is basically useless. The lower deck is far enough above the ground to accommodate a battery, though slinging a battery under the frame has significant disadvantages. Fig 2 shows the characteristics for the 1147 SF propeller. 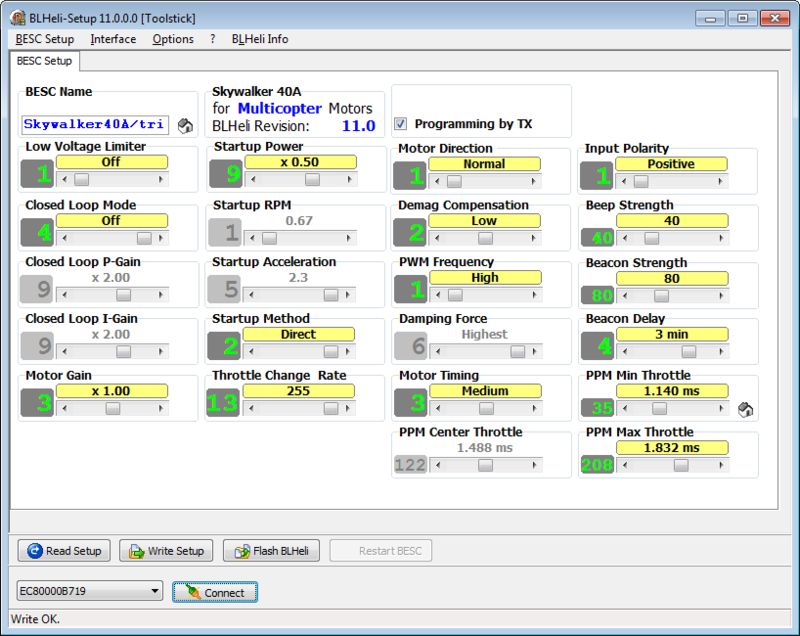 The green dots are for an operating point of 1170g thrust for each propeller at 9.0V (WOT on a flat battery), and the indicated motor power is 118W at is 6560RPM. The efficiency scale (eta or η) is optimistic as the model does not properly take into account the efficiency impact of PWM operation where shorter pulses of higher current create more winding loss than the DC equivalent current. Nevertheless, input power for 4 motors on 9V should be a little above 100W, 10A has been allowed in battery endurance planning. Power consumption was measured with the fully populated X450 (though with no additional payload) at 7.5A and 760g in the hovering state. Indicated motor/ESC efficiency is (16.8*4)/(7.5*12)=67/90=75%. More current is required to climb vertically, but the quad should climb at a modest rate at that current with modest lateral velocity (due to increased lift because of the lateral movement). At 8.3V, the motor should achieve about 6,310RPM and about 375g of thrust which would accommodate a payload of perhaps 750g with reduced performance. Under these conditions, motor output power would be about 40W each, DC current about 6A each or 24A in total (10C) and motor dissipation around 20W each. Overall, operation at that power is well within the limit of the battery current, mission time is dramatically reduced. The motors are capable of 8,000RPM with these propellers on 11V, for maximum input power of 120W each, 44A (18C) in total, total thrust of 2400g. The following are notes on the construction. Some issues were noted during initial build, some a little later. Fig 4 shows the FC mounted with self adhesive foam (for vibration isolation) to a small square of acrylic which is again foam mounted to the frame. 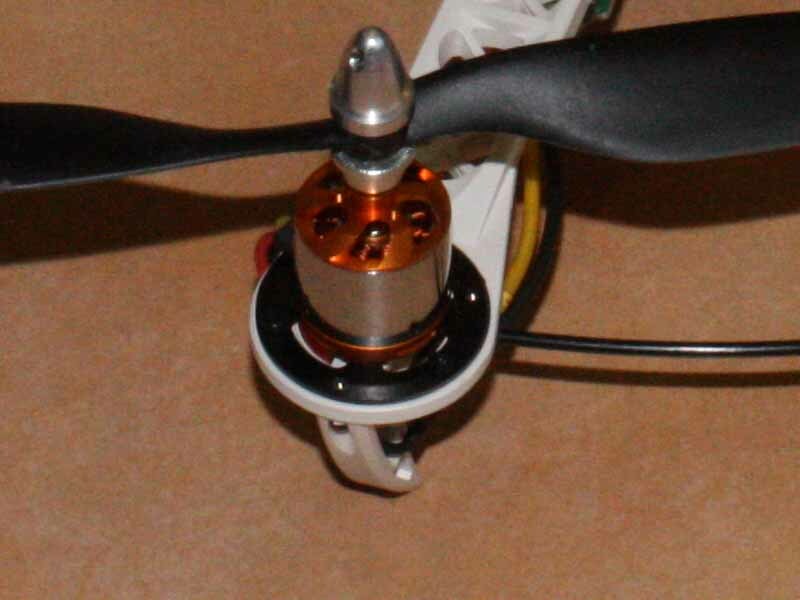 The quad uses nominally 10"x4.5" two bladed slow fly propellers. These are available from a range of sources, and initially the cheap ABS plastic ones have been used. The motors included propeller mounts with collets to suit the 4mm plain shafts, and M6 threaded extension for the propeller. Propellers needed to be reamed out to M6 to suit the adapters. Power distribution is a custom wiring harness with XT60 connector for the battery, and three way 3.5mm connector pairs for the ESCs, and a 2mm connector pair for the voltage monitor. 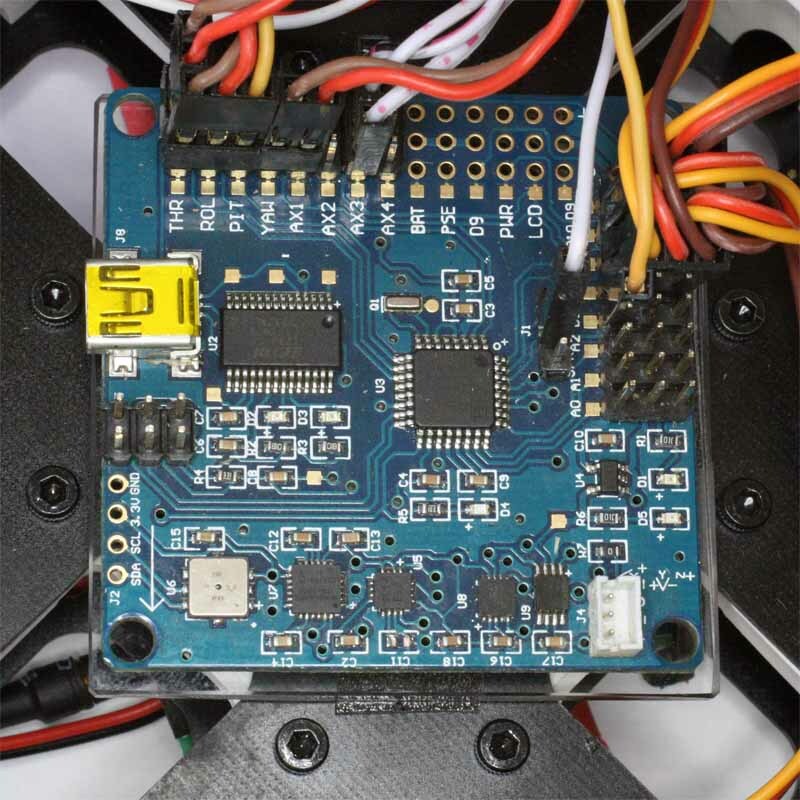 The flight controller board came with no documentation, no schematic and inadequate information as to the settings in the configuration config.h to build the appropriate flash module. Table 1 shows the receiver connections. Table 2 shows the ESC connections. Table 3 shows the Bluetooth connections. diff.htm is a report of the differences between the distribution config.h and that used. 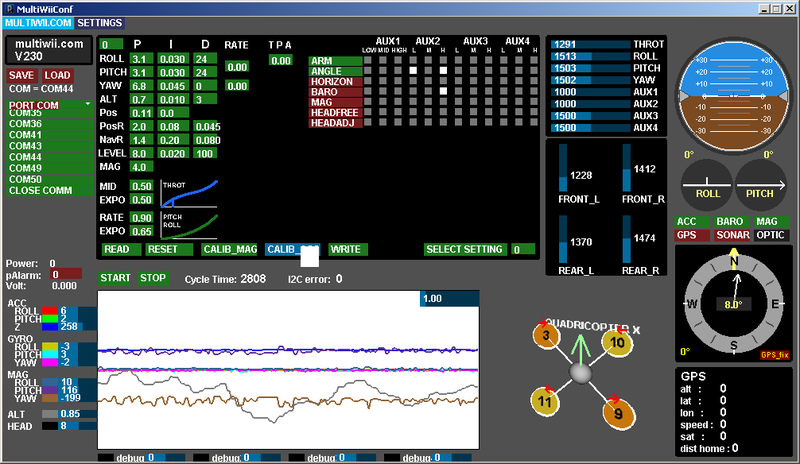 Fig 5 shows the voltage the MultiWiiConf configuration tool screen with the quad hovering but loosely held in the hand. The purpose of this test was to evaluate the residual vibration sensed by the board. 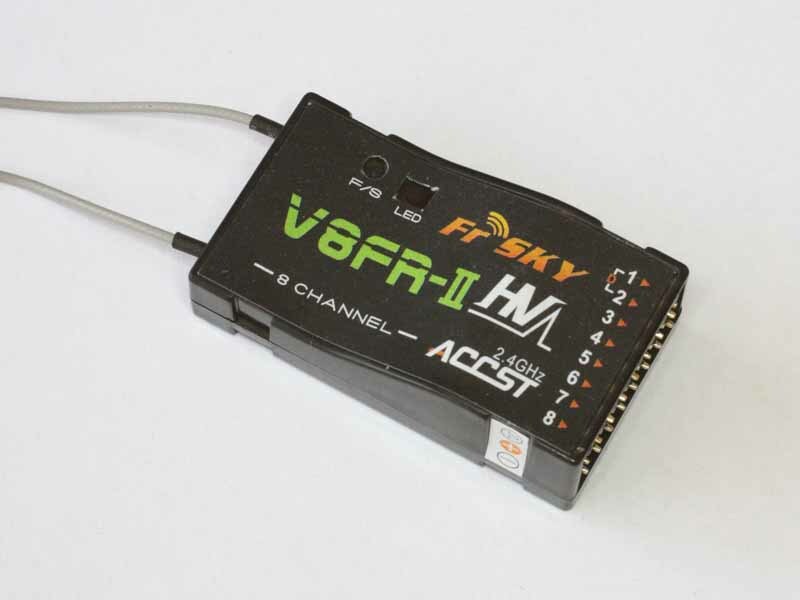 Figs 6 shows the FrSKY V8FR-II HV receiver receiver. An inexpensive Hextronix Bluetooth module was connected for field tuning purposes using a smartphone app. The module was configured for name T01 (COM41 on W09) 115,200bps. The ESCs are Hobbywing Skywalker 40A with UBEC, rated at 4S. Figs 6a shows the BLHeli configuration. It delivers better drive system efficiency, and faster / finer resolution control than the stock FW. A Turnigy TGV-Detector was used to warn of low battery. Several of these were purchased, and they are fitted with a 2.54mm shunt to go on 2mm pitch header pins resulting in a loose and intermittent / unreliable connection. More Hobbyking quality! The TGV-Detector was fitted with a 2mm shunt, and it performs reliably though at the first audible alarm it is vital to get the quad down within 15s, it isn't much of an early warning. Fig 7 shows a test of the quad at 12.0V. There was 0.6A current drawn by the four ESCs and FC with the motor OFF, so 0.6A needs to be deducted from the figures in the graph. Expected hovering rpm is around 4,300, avg motor current consumption was 17.5-0.6=16.9A. A series of full stick accelerations was conducted, and current peaked at 72A, rpm peaked at 7,600. Crash damage has mostly been to the propellers which seem reasonably robust... but they are breakable. A couple of spare frames were purchased to provide spares.